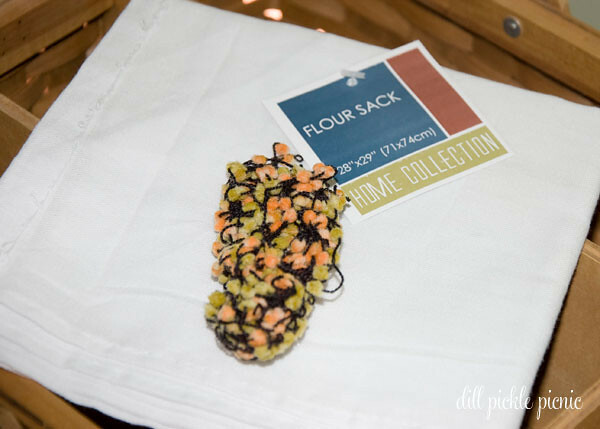 Fabric for pillow cover, I used a Flour Sack Cloth from my local Dollar Tree. 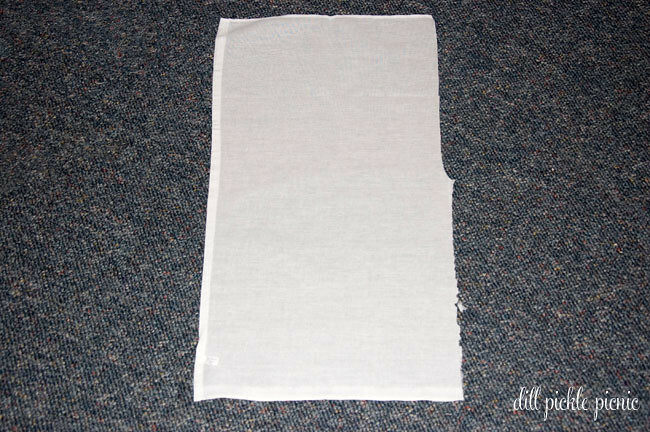 You will one piece of fabric that is 14 x 14.5 inches. 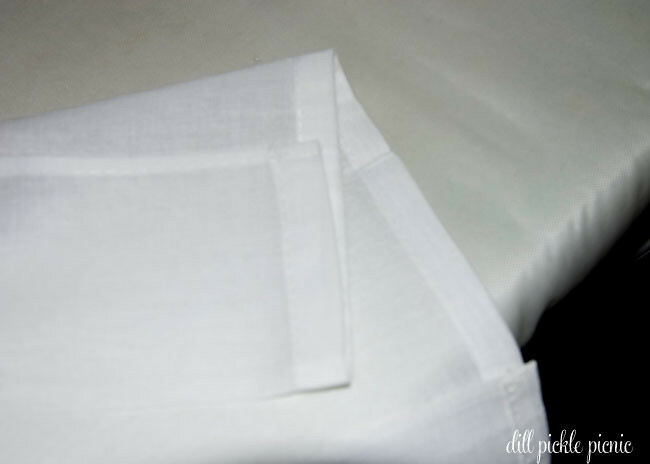 Gather all your materials and press the fabric to remove all creases. 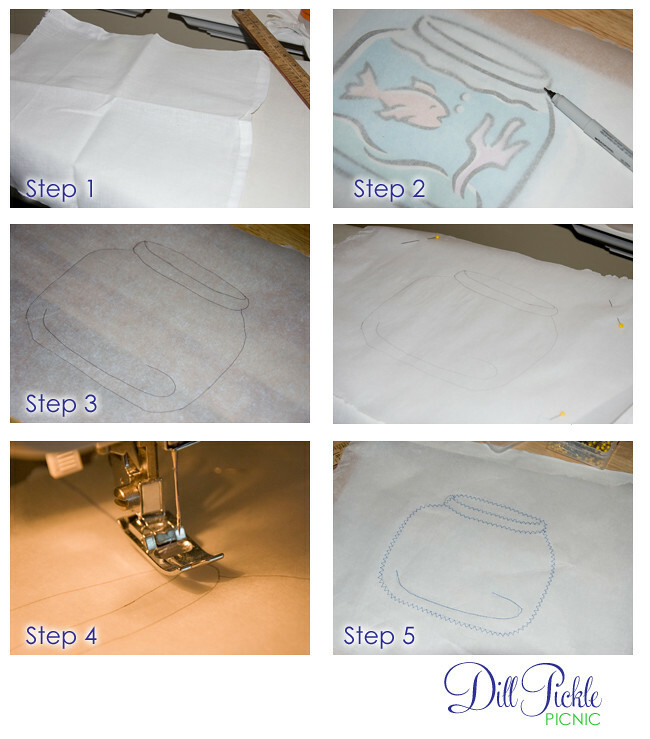 If using the thin flour sack fabric you will need to cut the fabric in half length wise. 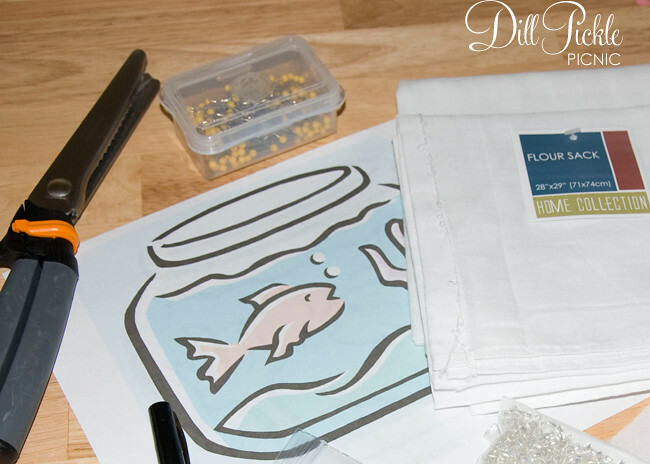 If you remember I used the other half of this same piece of flour sack to make this fun fish pin board. 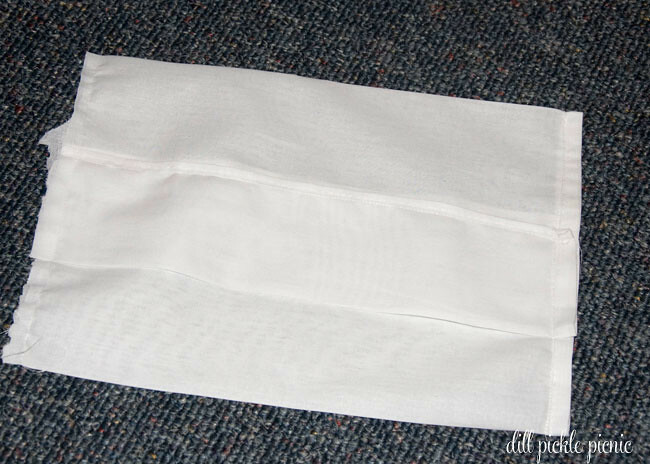 Using your ruler pull the top edge of the fabric to the back 3.25 inches and stitch down along the bottom edge. 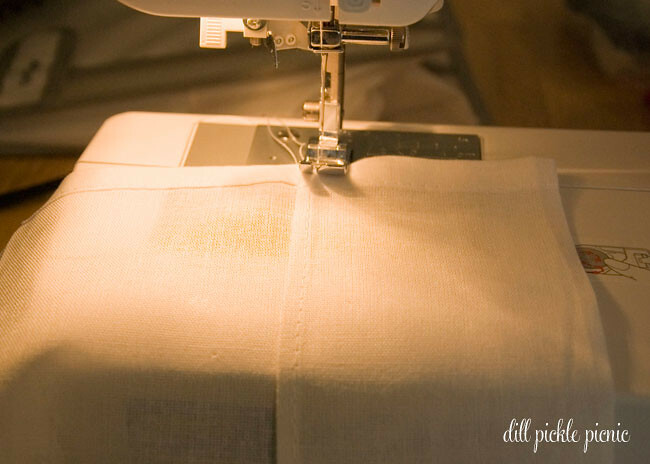 With the sewn edge facing down, pull the bottom edge of the fabric up and over to the top 6.5 inches and press. 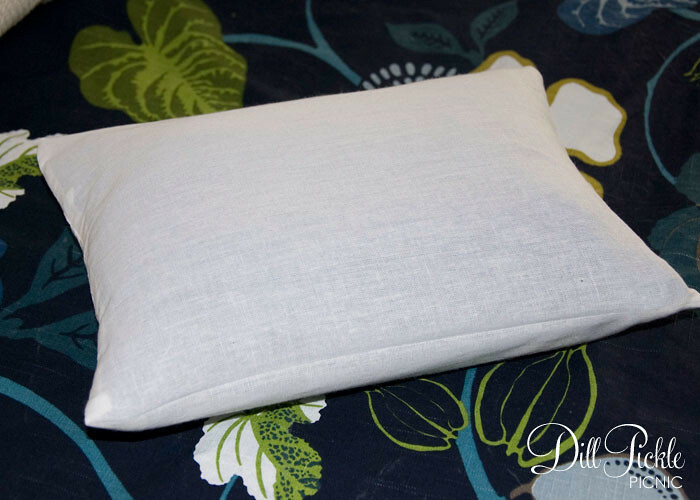 Turn the pillow cover inside out and you are ready to use. 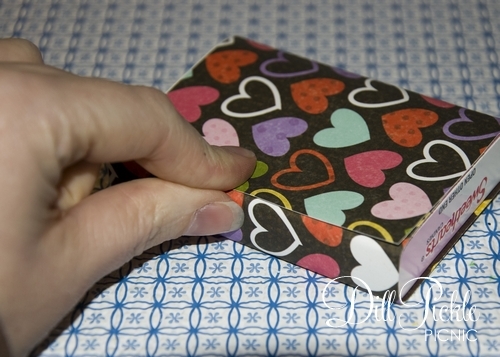 Place a piece of cardboard inside the pillow cover to keep any stray glue from gluing it closed. I wasn’t sure of my freehand skills so using a washable pencil I drew a quick outline of my letters. 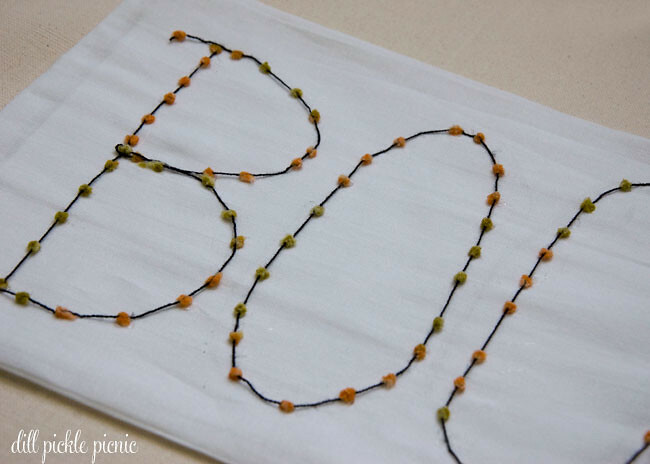 I took my spooky yarn from the “envelope of doom” and glued it around the letter outlines. To make it a bit more sturdy for future washings I added several stitches around the furry dots to hold everything in place. Remove cardboard, stuff, and enjoy! You’ve already seen the fishbowl message board I made as a gift to a friend. Now, let’s bring on the fish…the fish thumbtacks that is. 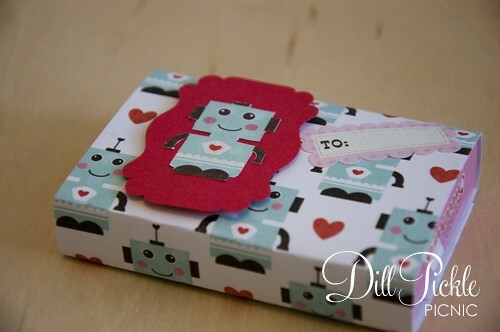 I mentioned the Envelope of Doom in a previous post, this is second of the 3 (or more) projects I created using several components from the “envelope of doom“. 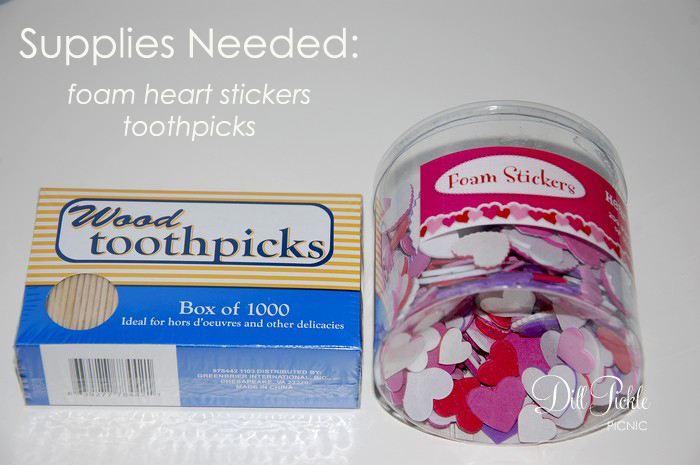 Don’t have an envelope full of supplies…don’t worry. 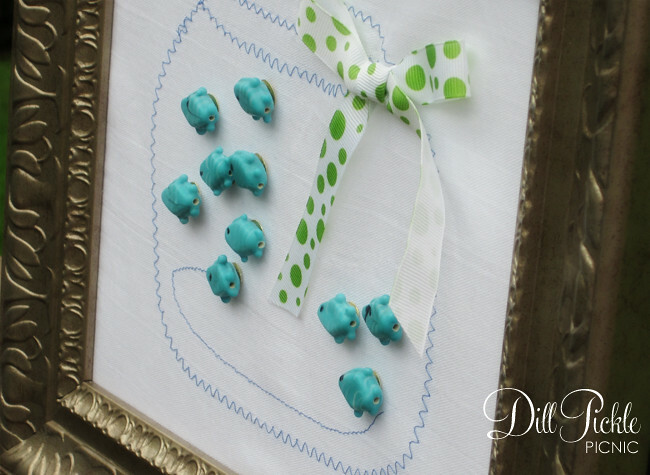 You could create this project using items from your local dollar store & craft store as well! 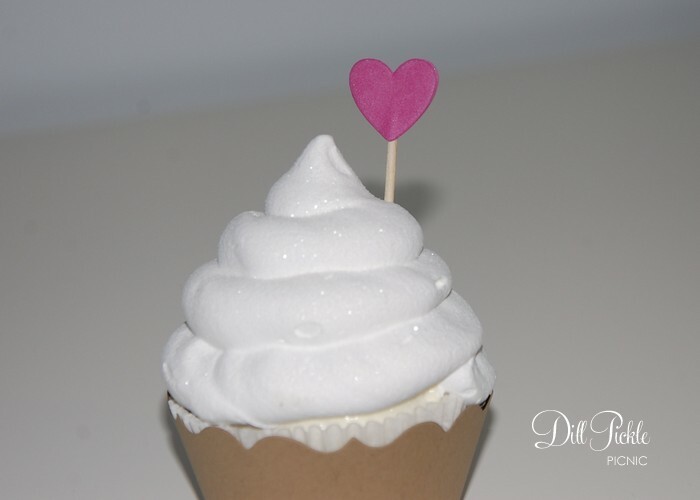 This is one of the quickest projects I’ve taken on in ages. Any glue that will attach your bead material to metal will work here. I used super glue which held “ok”. One commenter suggested E6000 as a better option. This is potentially the easiest tutorial I’ve ever written, and I think the photos tell the whole story. 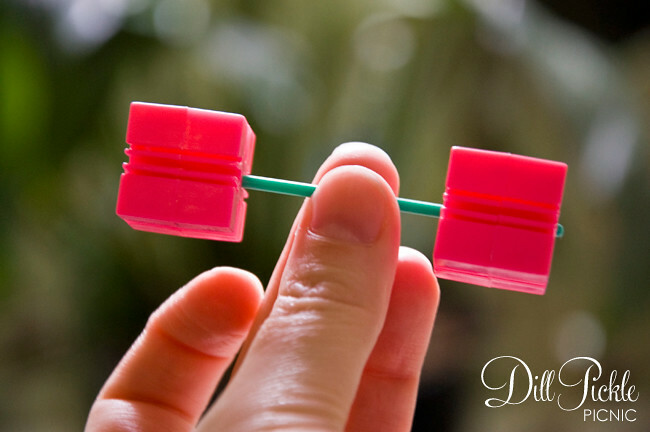 Count out the number of thumbtacks you need, and spread them out onto your Styrofoam block. 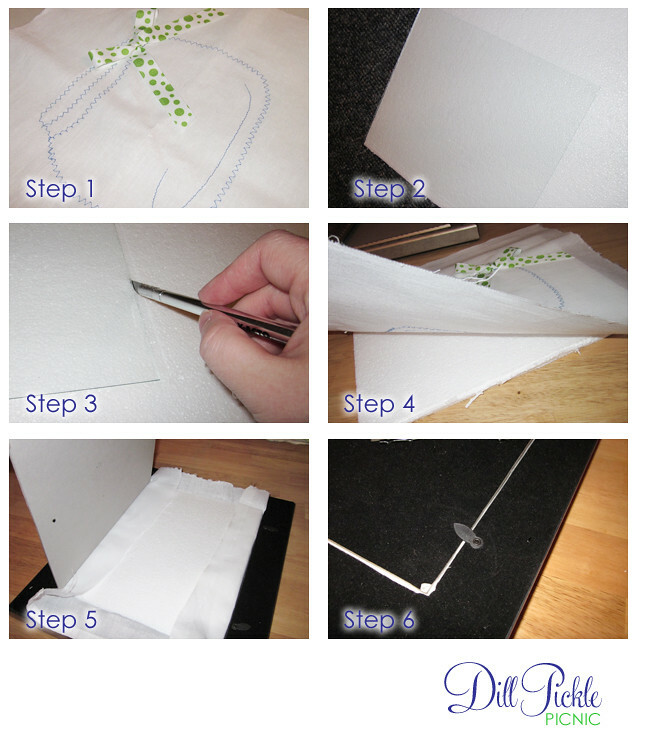 By placing the sharp end into the foam it will hold them in place while you glue down the fish. 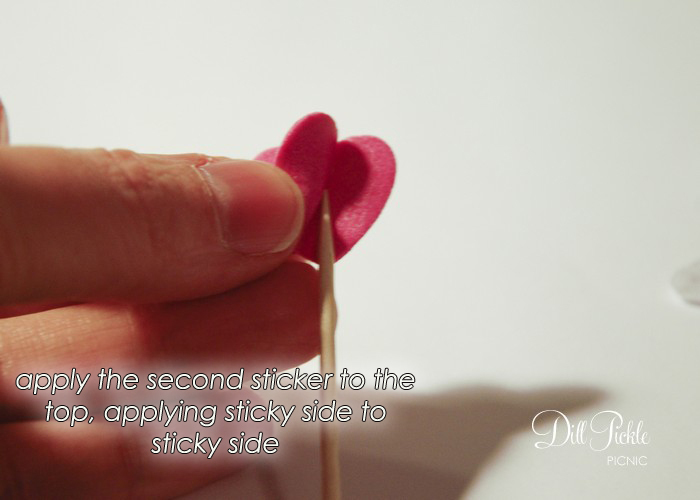 Squeeze a medium-sized amount of super glue onto the first tack. I’m using the gel type of super glue from my local dollar store, this is because it is thicker and easier for me to work with. It also means fewer drips which makes it MUCH safer for me to use. 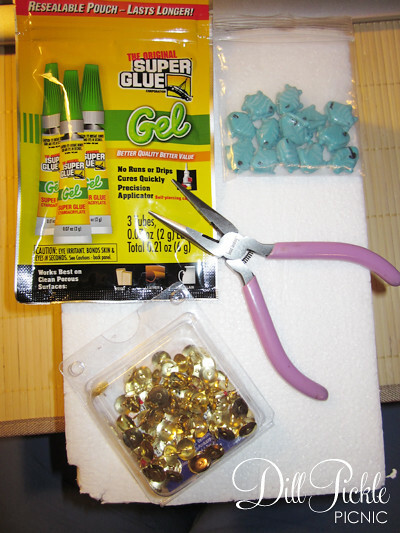 Place a fish bead onto the drop of glue and press down. Let dry completely. 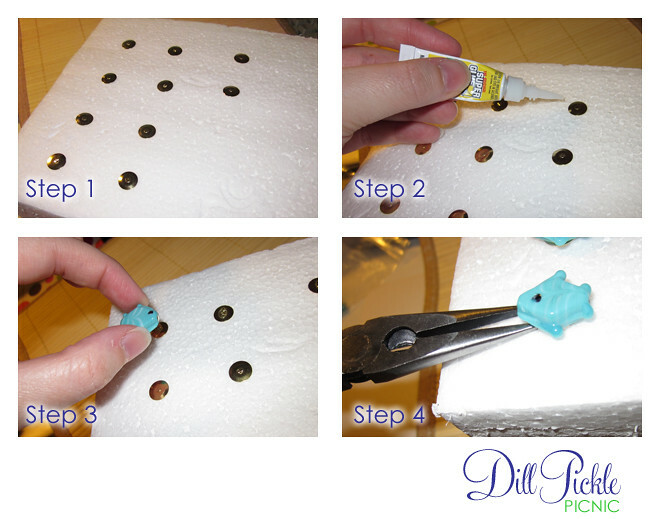 I use the pliers to help center the beads really quickly before the glue sets. 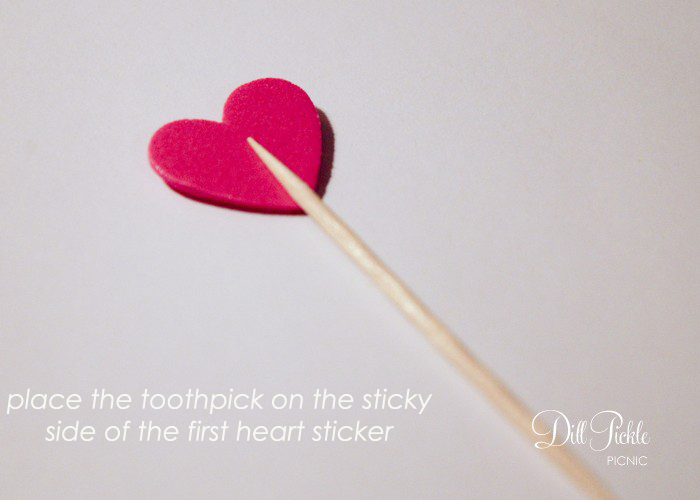 It is also helpful when removing them just in case they aren’t completely dry. 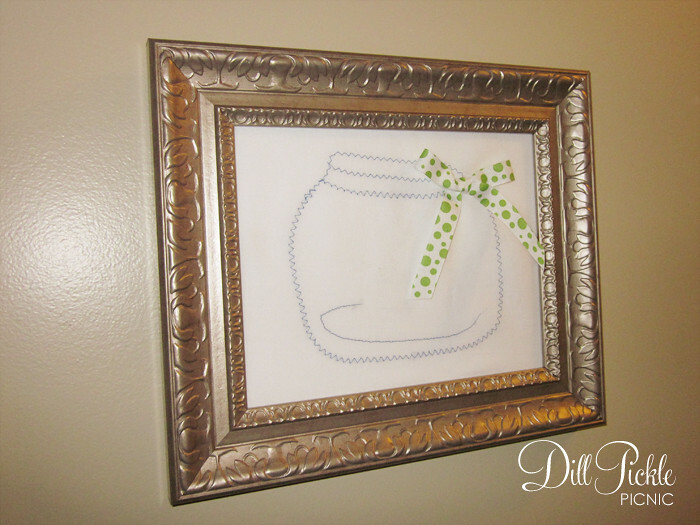 I think they really make the note board look more like wall art… even though now I wish I had painted the frame a fun green to match the ribbon. 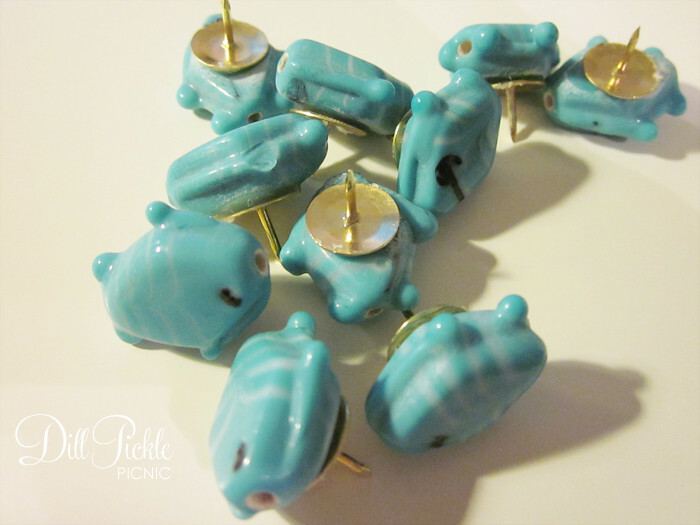 I think this process could be fun to make all sorts of cute thumbtacks, so I see more of these in my future. How about you? 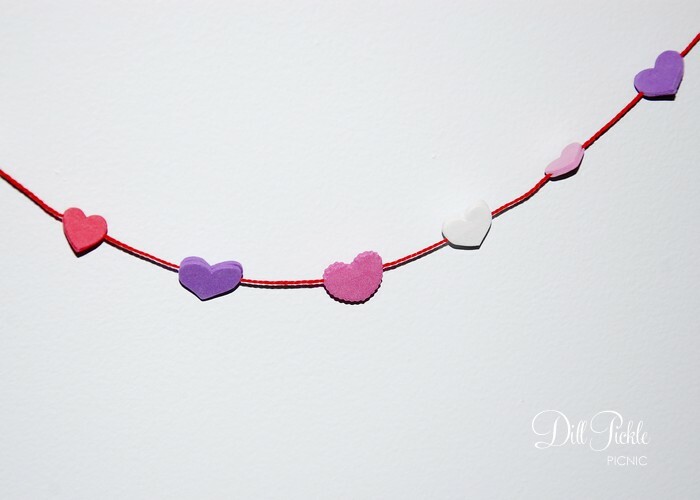 Do you use cute things to attach things to your memo boards and if so where did you find your favorites? The Crazy Crafty Wicked Cool Envelope of Doom that it! Now, that sounds like a challenge I’m up for…and as luck would have it. I was one of the winners! After a bit of a technical glitch that put my envelope a bit late arriving, I opened my mailbox and was off to an immediate start, chanting “must catch up, must catch up”. I ripped it open and spread out the contents quickly take stock of the monumental task ahead of me. Honestly, I’m not sure what to think of some of this stuff. 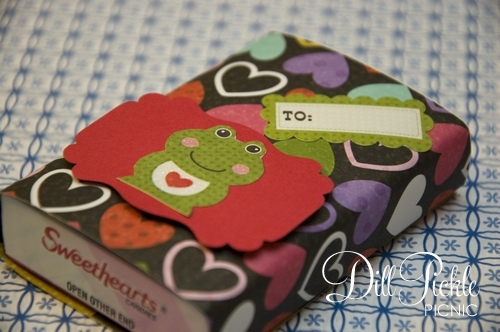 There is some odd yarn-like stuff, a panel of hologram valentines, and an expired Starbucks card. I put all that aside for a moment and focused on these odd-looking pink squares. Interestingly enough they matched up exactly with the green pixie stick deal which makes me think they might be some sort of construction toys…. Wanna see? Oh, TOYS! That’s it… I have a friend who collects Barbie & her assorted stuff…so I quickly assembled the 3 pieces together. Do you see where I’m going with this? Now that’s my kind of workout! Just kidding Michelle…I’ll be posting at least 2 of my projects from doom in the upcoming week. 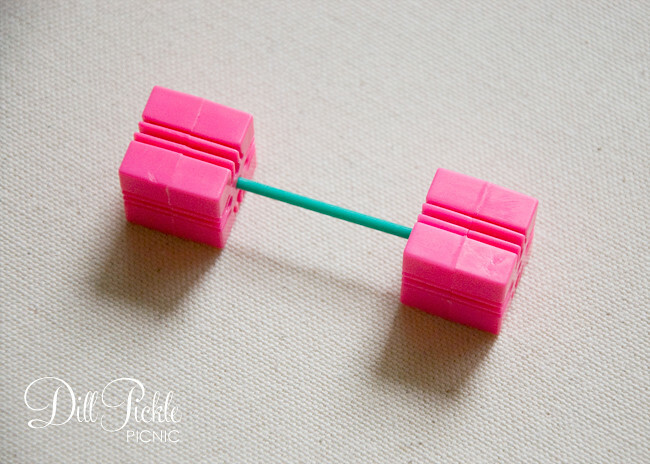 Couldn’t resist kicking off this challenge with a bit of crafty humor! 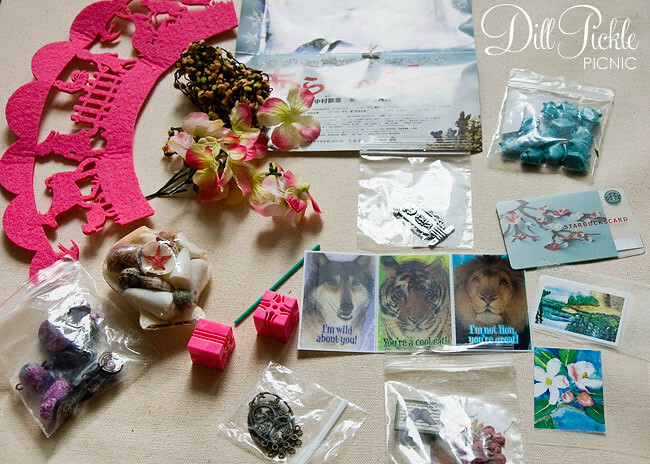 If you want to see the other goodies these lovely crafters are coming up with, check out Michelle’s blog: Mich L. in L.A.
What do you think? 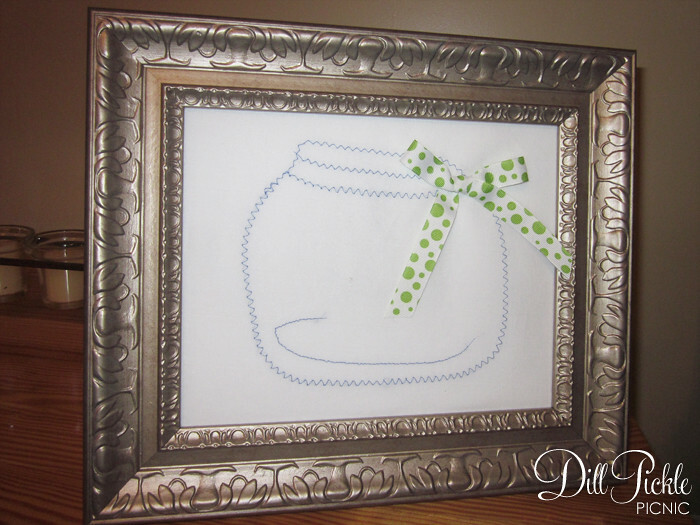 I’m thinking it’s quite cute…and so easy to make that you could even have you kids help you with this project. 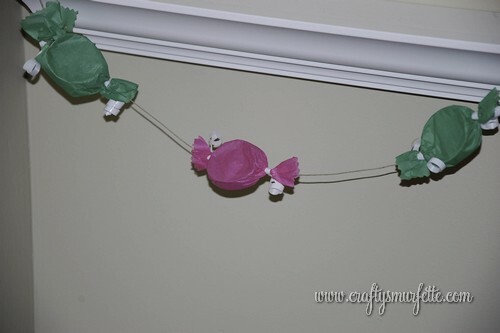 It could be fun for a child’s birthday party or even dressed up a bit more to hang behind a candy buffet. 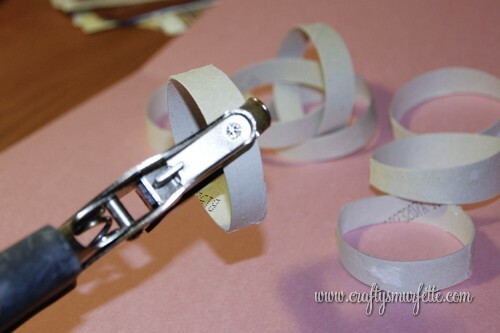 Using a standard hand-held hole punch punch two holes across the tube from each other. 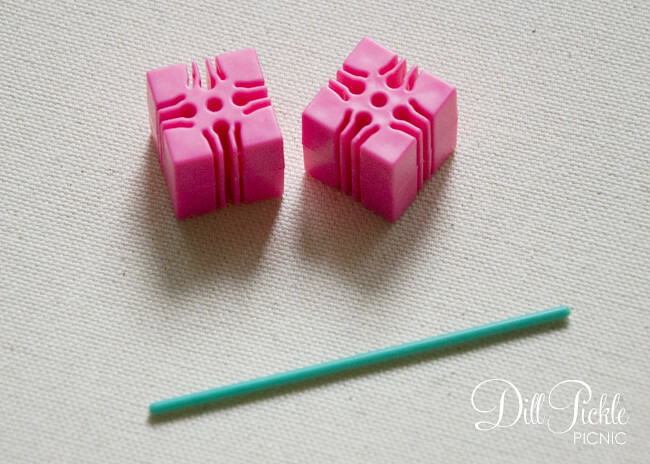 Repeat this process for each of your 1/2 inch pieces. 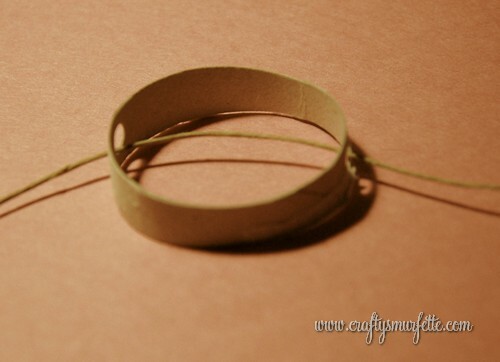 Cut bunting twine to your desired finished length. 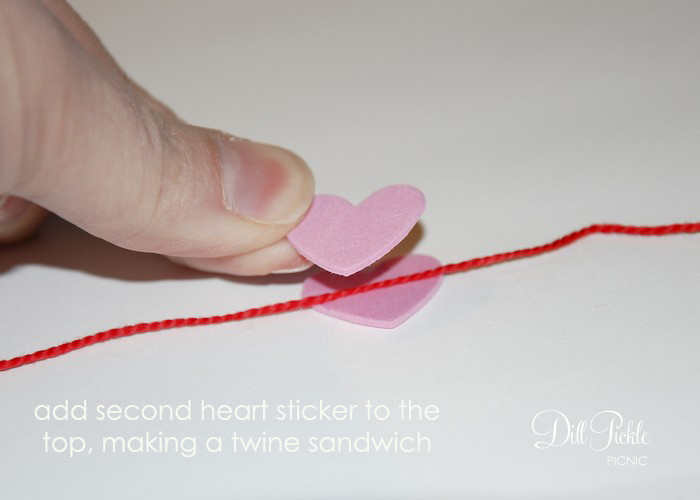 Using 4 inch pieces of curling ribbon, tie off each side of your “candy” with a hard knot. 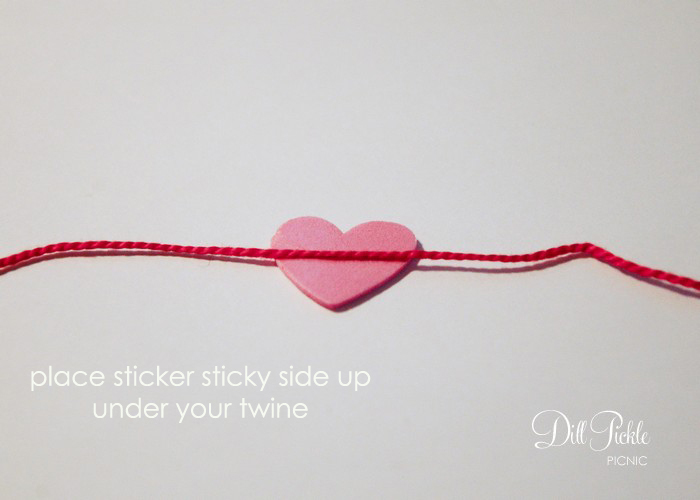 Repeat the length of your twine. 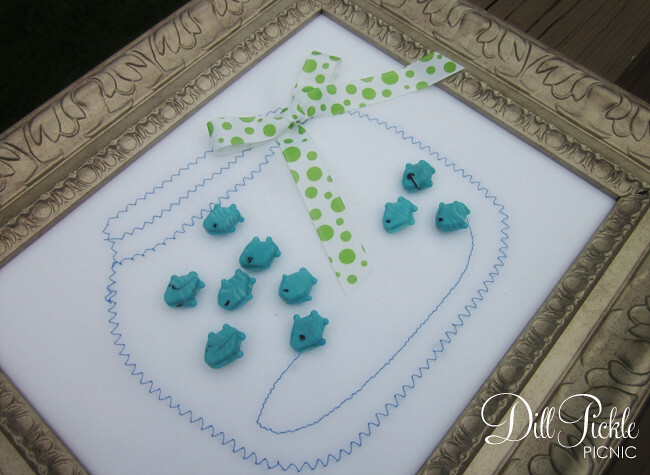 You can move the pieces slightly along the finished product to help evenly space them. 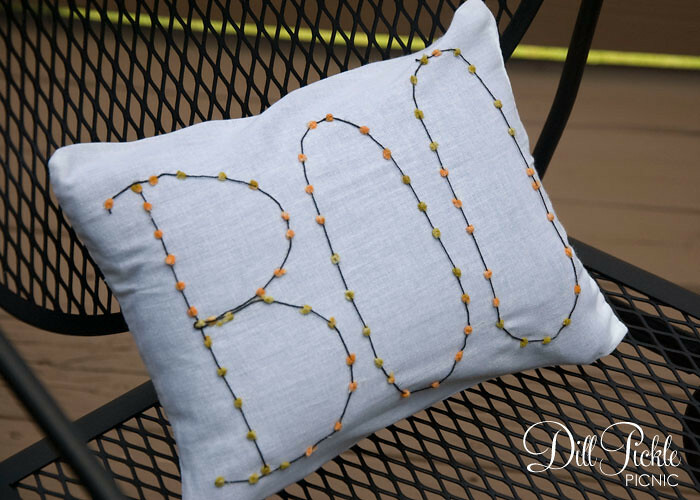 See…quick, easy, and a fun way to turn a common household trash item into something fun & decorative! 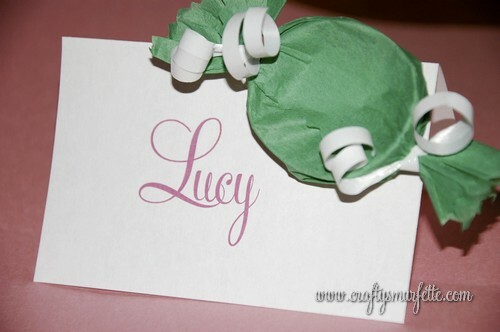 And if you have extra “pieces of candy” left over you could always glue them to place cards or signage for a sweet look. 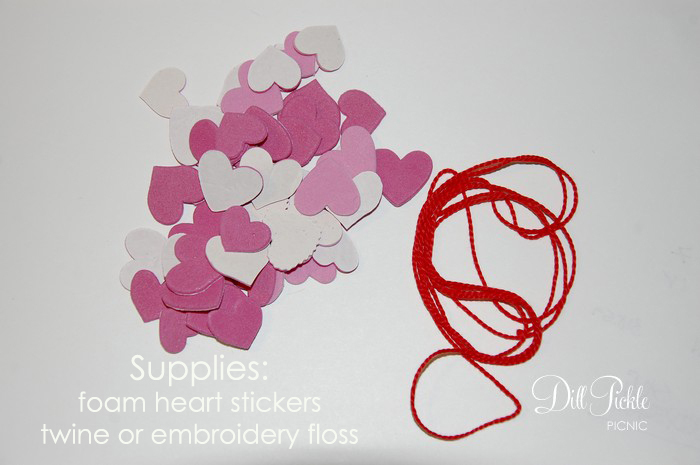 Price Breakdown: Free from my trash & craft stash! 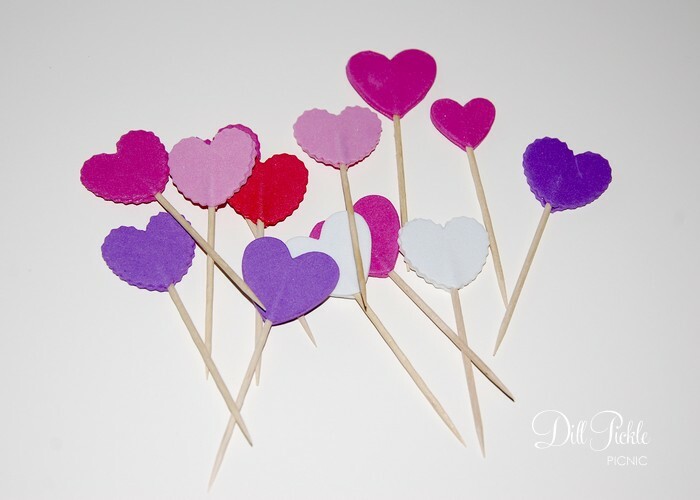 However, if you wanted to create these with no supplies on hand you could do so entirely from your local dollar store! 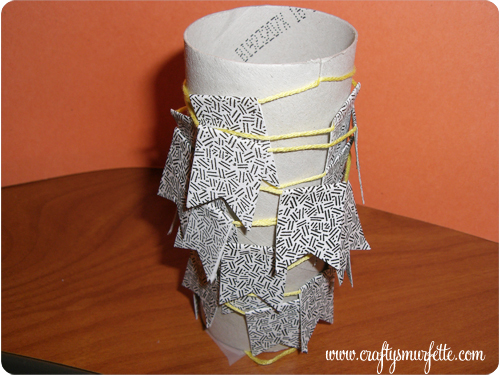 What crafty fun will you reuse trash & stash items for this week? I’ve been saving envelopes with cool security patterns since I saw a cute cake bunting from the ever wonderful Martha made from her papers that mimic the same patterns. So, what better time than during April’s Stash Bust to finally put those envelopes to use. Now after making a couple I think this would be an easily portable craft project to work on while I’m traveling for work and stuck in hotel rooms! The possibilities of how to use these are endless! 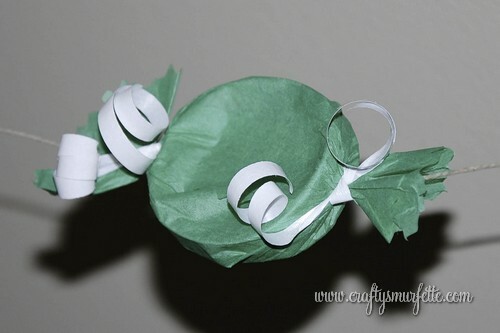 You can use them to decorate a cake, create a pretty package wrapping, I’ve seen them attached to fronts of greeting cards, craft show displays… and of course you could use any type of paper to make the flags. 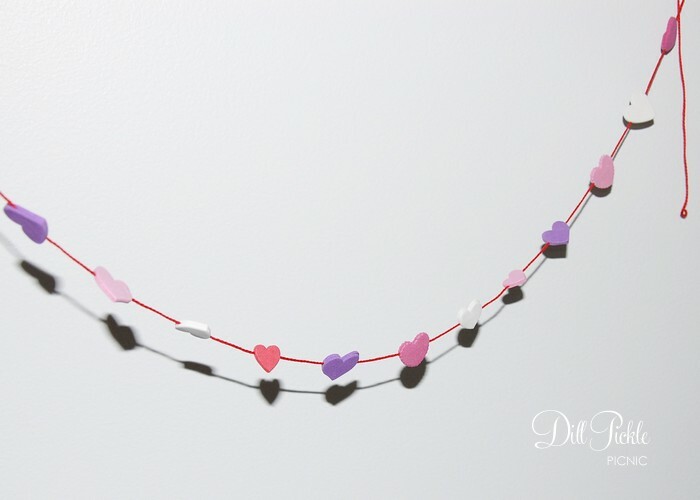 How will you use your bunting? OK, let’s get started! 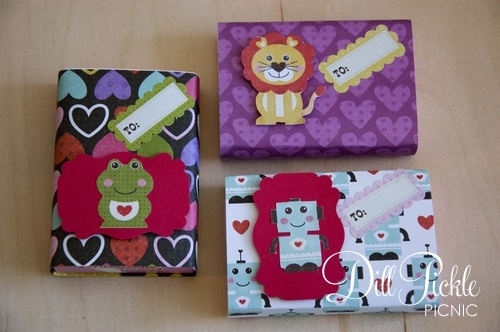 This is a super simple project, but I’ll admit it is a bit more time consuming than I thought. To help speed up the process I’ll include several hints in the instructions below. Carefully take apart your envelopes exposing the inner security lining. 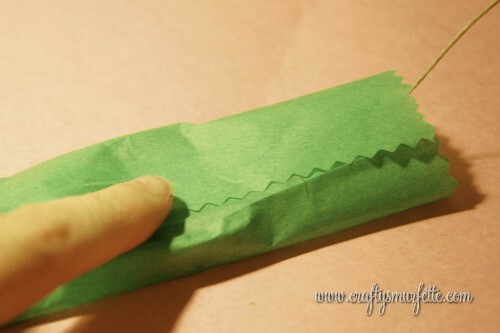 To do this I use my bone folder and carefully slide it between the seams to open them up. 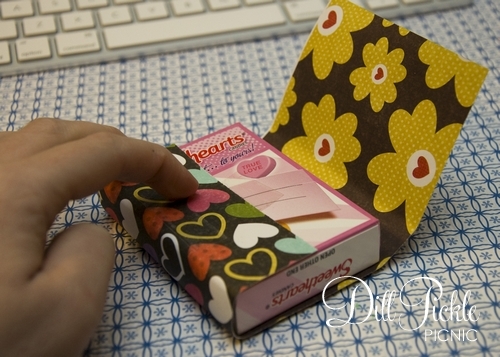 You could also use an envelope opener or just pull them apart as well. Use your paper-cutter (or scissors) to square up the pieces, and remove the edges and window panes (hint: I’m putting those window panes off the side for another idea I have swimming around in my noggin). 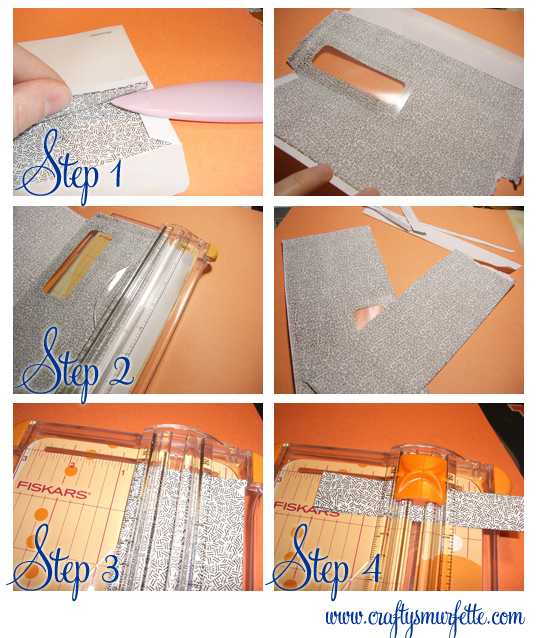 Now, using either your cutter (hint: it’s quicker and easier to get consistent sized pieces using a paper-cutter with built-in ruler) cut your envelope into 3/4 inch strips. 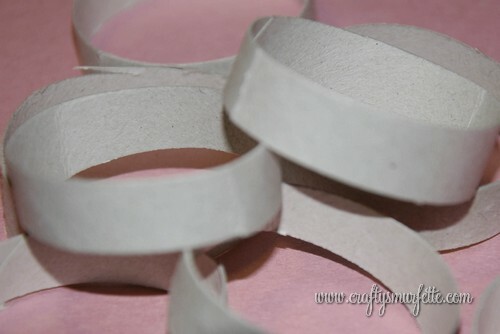 Stack those strips up together and use your cutter to cut those into 2 inch pieces. 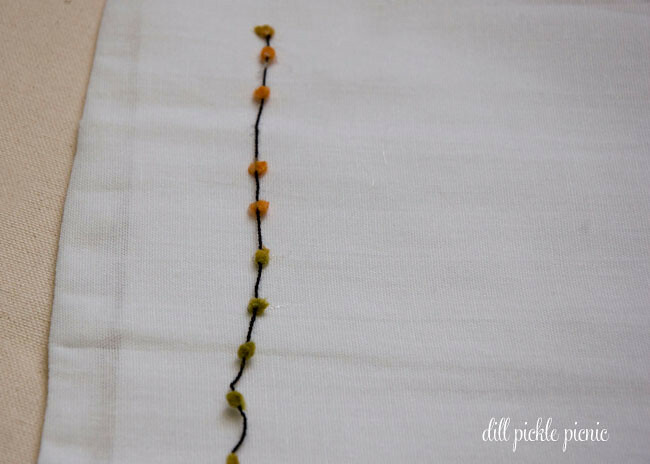 Measure & cut a 5 foot piece of either embroidery thread or bakers twine (hint: if you use embroidery thread use a piece of tape or glue to seal off both ends to keep it from separating as you add your flags). 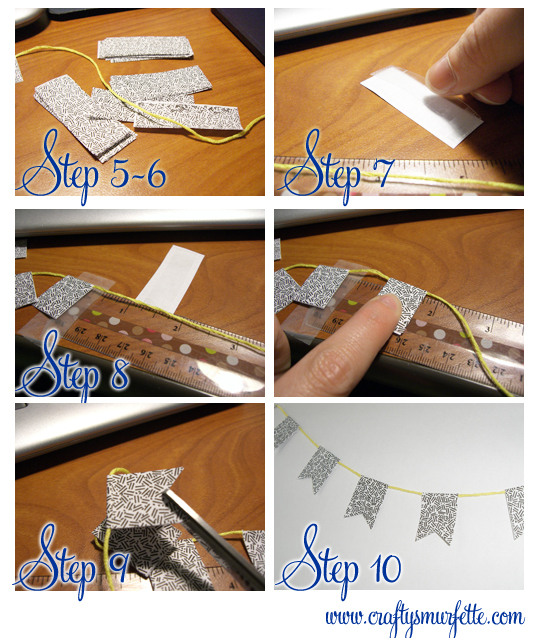 You will start assembling your bunting by placing the first flag 6 inches from one end of your twine and stop 6 inches from the other end to allow you room to tie up your bunting. 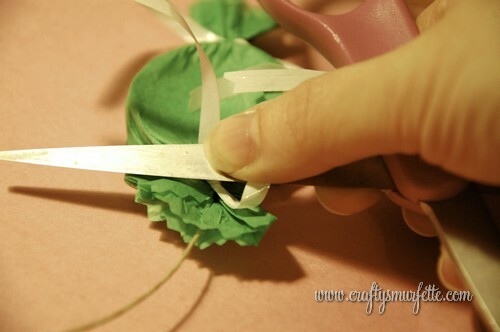 Apply your choice of adhesive to your first flag and carefully fold it over the twine sealing the edges together. For this example I used double-sided tape that ran half the length of the flag. 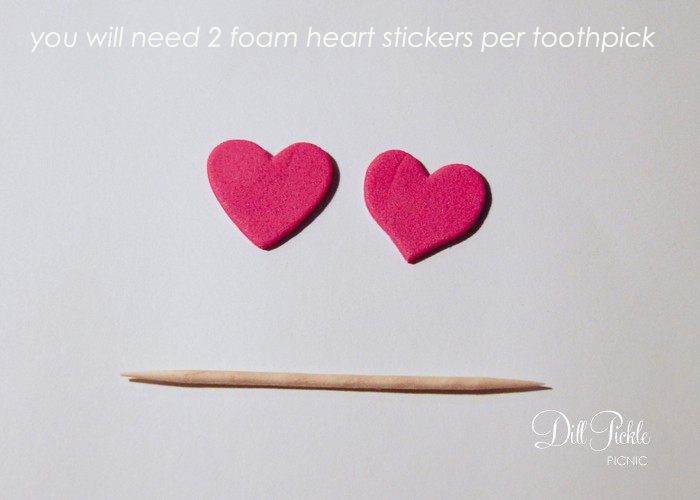 You could also use a glue stick but it will be a bit messier. 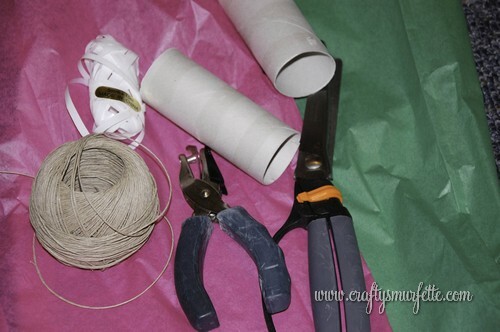 (hint: if you have a Xyron machine you can run all your pieces through at once and then just peel them off and fold over the twine. It made the process MUCH quicker). Continue this process by adding a new flag every 1.25 inches. You can always tape a ruler to your desk to make it easier to decide where to place the next flag, but after the first few I went with the just eyeball it method. Wait…but how do I keep it from getting all tangled up until I’m ready to use it. 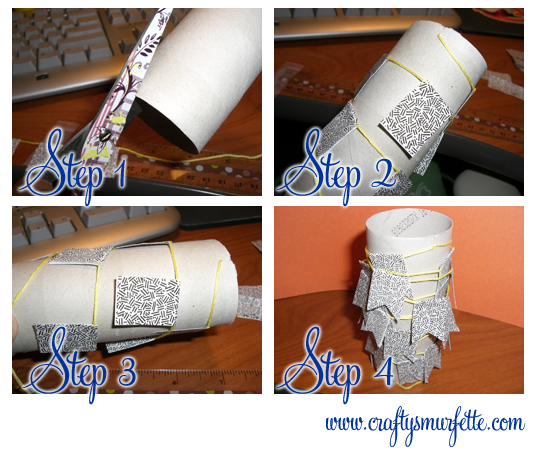 Just take a toilet paper roll and cut a small slit in the top edge. Take one end of the bunting and slide it into the slit. 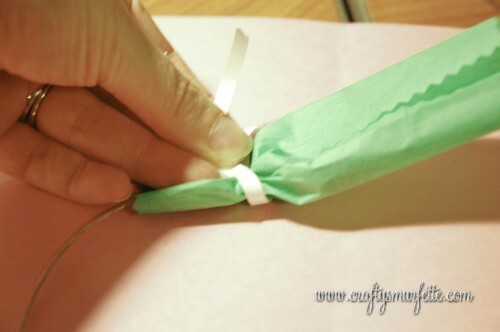 Carefully roll your bunting around the tube and once at the other end tuck it inside the slit as well. 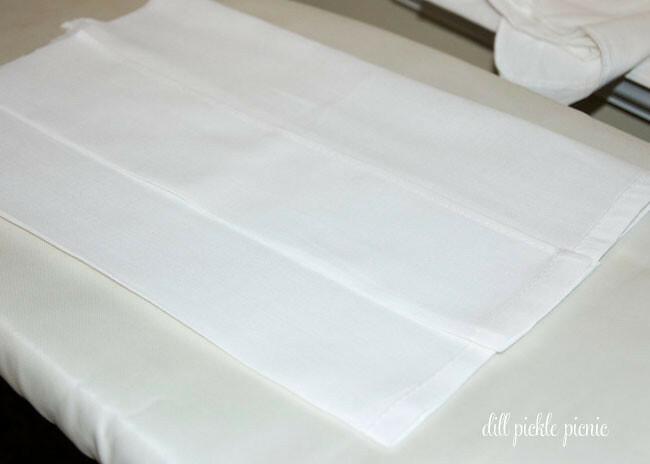 There you go…all rolled up and ready to use! 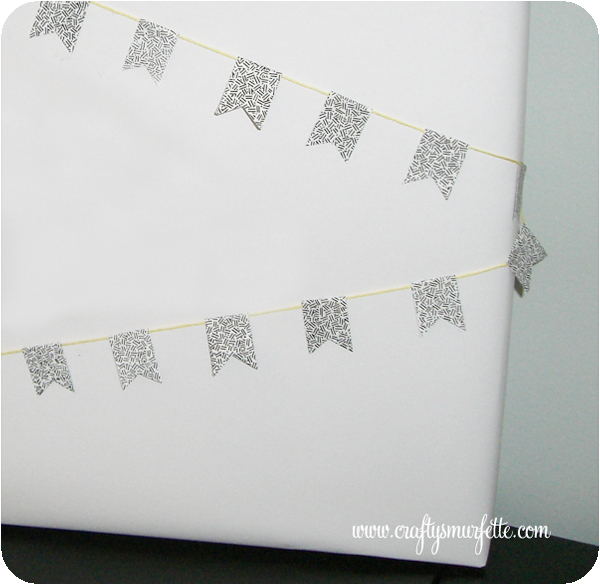 So, let’s recap: 4 feet of cute bunting completely from my stash & trash! PS. I’ve decided to list a few of my “crafty projects” in the etsy store over the next few weeks, it’s kinda sad how long it’s sat empty!